Mannlicher Carcano is an experimental, improvisational audio collage group who have been working together since 1987, creating performances, recordings, installations, and radio art. They produce a weekly radio and web-cast, The Mannlicher Carcano Radio Hour. The group has released over 50 cassettes, CDs, CDRs, and vinyl recordings, and archived hundreds of mp3 radio transcriptions. Mannlicher Carcano is a pirate-radio sound-terrorist musical collective who use improvisational audio collage techniques to control minds. 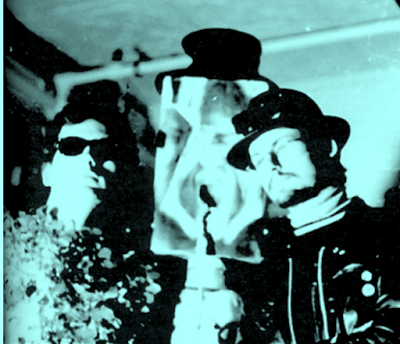 Formed in 1984 by those clandestine cryptonyms "Really Happening"(Los Angeles, CA), "Porter Hall" (Guelph, ON) and "Gogo Godot" (Winnipeg), Mannlicher's Anarchist-Avant-Garde, Post-Punk, Classical-DIY, Plunderphonic, Experimental-Apocalypse, Analog-Acoustic-Pop-Autopsy style is auralgasmic. The MannlicherCarcano Radio Hour www.cfru.ca(Saturdays at noon), MC have issued hundreds of self-released titles, appeared on experimental music and radio art compilations, produced soundtracks for films, created installations for art gallery's and museums, and have tended the fires of their loyal cult-like following on theInternet." Mannlicher Carcano's Off Register is a soundscape created by the simultaneous playing of three individually composed sections of different lengths, which constantly recombine into new configurations. Mannlicher Carcano is comprised of three members: Porter Hall, Really Happening, and Gogo Godot, each of whom lives in a different North American city. Each collaborator created his portion of Off Register without knowledge of the other components, thereby creating a sound environment removed from both geographical specificity and individual creative intent. The work is a continuation of the group’s Ambient Narrative series, which uses narrative elements and structures (musical, verbal, documentary, and theatrical), and assembles them into a shifting, participatory, non-hierarchical continuum. Mannlicher-Carcano is actually an Italian military 6.77 mm (.266/67 cal.) rimless bottle-necked rifle cartridge, developed from 1889-1891 and used in the M 91 Carcano rifle and its successors. In US parlance, the moniker "Carcano" is frequently added to better distinguish it from the rimmed hunting cartridge 6.5x52mmR (US version: .25-35 Winchester). Ballistically, its performance is very similar to that of the 6.5x54mm Mannlicher-Schönauer. Since 1980, the 4 or 5 or 6 Floptops known as Mannlicher Carcano, a performance and recording group based in the Various Area, have been creating records, CDs, video, fine art, books, radio and live performance using appropriated sounds, images, objects, and text. Mixing original materials and original music with things taken from corporately owned mass culture and the world around them, Mannlicher Carcano re-arranges these found bits and pieces to make them say and suggest things that they never intended to. In doing this kind of cultural archaeology and “culture jamming” (a term they coined way back in 1984), Mannlicher Carcano have been sued twice for copyright infringement. ... an improvisational audio collage and radio art collective that coalesced in the mid-1980’s out of a number of new music, sound art, and post-punk experiments, and has been performing and recording regularly for over 30 years, in spite of not living in the same city for the last 25. ... Really Happening (Los Angeles, CA), Porter Hall (St. John's NFLD) and R.F. (Gogo) Godot (Winnipeg, MB), though the group has many regular adjunct participants, and has played with over 200 collaborators over the course of its history -- current regular adjuncts include Kenneth Friendliness (LA) and Rock Hill (Montreal). ... MC’s early performances were highly theatrical, with costumes, stage sets, and elaborate collaged light shows providing a visual analog of their densely layered sound. Then as now, the sound was generated using a wide range of sources, including traditional (trumpet, bullroarer, drums) and invented (spring-strung bass, Ventor, cast aluminum cello) instruments, thrift store electronic equipment: portable record players playing warped Montovani, sound effects at the wrong speed , or stuck fragments of religious tirades ; children’s toys, radios, live phone calls, tape loops, field recordings of environmental soundscapes and contact miced appliances. ... in addition to their experimental theatrical performances, a group of participants in numerous sound art exhibitions, academic conferences, new music festivals, experimental radio and radio art broadcasts, as well as the participating in cassette culture underground with the production and distribution of 9 full length cassettes, as well as a number of quirky vinyl projects. Mannlicher Carcano was the subject of a cover story in the Fall 2002 issue of the highly respected new music journal Musicworks. ... an early web presence, albeit (mis)using generic site-building programs and vanishing hosts. Their first CD Half Duplex Receive Only was released in a limited edition in 2001, followed by 11 further self-released CDRs mostly drawing material from their weekly live 3-city improvised audio collage radio program and webcast “The Mannlicher Carcano Radio Hour”. ... The Mannlicher Carcano Radio Hour combines live signals from up to five different cities, transmitted via Skype or over phone lines from their respective locations then added to and mixed live to air and web by Porter Hall. The Mannlicher Carcano Radio Hour was hosted by Peterborough’s Trent Radio, CFRU-FM 93.3 at the University of Guelph , and now finds its home at CHMR FM in St. John's Newfoundland.